Juan Verde is the Deputy Assistant Secretary for Europe in International Trade Administration’s Market Access and Compliance Unit. In this capacity, he leads the Department of Commerce’s efforts to help solve trade policy and market access issues facing U.S. firms seeking to grow their business operations in Europe and Eurasia. I have just returned from a two-day visit to Lithuania, where I met with the Prime Minister and other senior government leaders. I had the pleasure to meet with the members of the first Department of Commerce Certified Trade Mission to that country, led by Illinois Congressman John Shimkus. Lithuania is a small nation, and many American companies are probably not familiar with it. It is located on the Baltic Sea, bordered by Poland, Belarus and Latvia. It is a member of the European Union and NATO. It is providing a valuable contribution to our efforts in Afghanistan. From left to right. U.S. 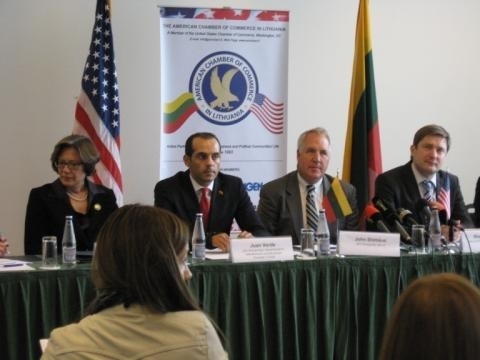 Ambassador Anne Derse, Deputy Assistant Secretary for Europe Juan Verde, Representative John Shimkus, Lithuanian Minister of Economy Rimantas Zylius. Despite its being a small nation, it is attractive to U.S. companies for a number of reasons. It is a gateway to markets in the east, and into the wider European Union. The government of Lithuania, from the Prime Minister on down, is committed to making the country an attractive place to do business. Government leaders meet regularly with the foreign business community to find ways to address its concerns. Lithuanian industry is a leader in many interesting areas, including laser technology. Its workforce is well-educated. The nation’s transportation sector is modern, along with its legal system. Lithuania’s leadership has enabled it to emerge from economic crisis to becoming one of the fastest growing in the European Union. Our trade with Lithuania is also growing rapidly, reflecting the economic recovery. As they consider expanding their markets, I encourage American companies to look at Lithuania. A steadfast ally, and a friend, Lithuania has much to offer.